You are looking for something unique, and for someone who can capture every important moment of your day. Take some time to sit down with Candace, you will be so glad you did. Visit theknot.com and search for Candace Byers Photography to see reviews from Candace's brides and grooms. 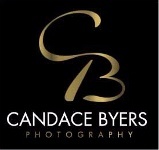 Candace Byers is one of the area's most highly sought wedding photographers. She is part of a select group of photographers in the world to hold a certification from the Professional Photographers of America. She is Best of The Knot and Wedding Wire. She is someone you will not want just for your wedding, but for all life's important milestones. I want you to have all YOU want and more. That's why we will meet and discuss how YOU envision your day.